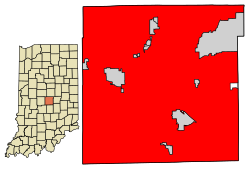 उपनाम: "Indy"; "Circle City"; "Crossroads of America"; "Naptown"; "Amateur Sports Capital of the World"; "Railroad City"
↑ "Indianapolis (city (balance)), Indiana". U.S. Census Bureau. मूल से August 3, 2012 को पुरालेखित. अभिगमन तिथि November 20, 2013. ↑ "U.S. Census Bureau Delivers Indiana's 2010 Census Population Totals". मूल से February 13, 2011 को पुरालेखित. अभिगमन तिथि February 11, 2011. ↑ "Definition of Indianapolitan". Merriam-Webster Dictionary. अभिगमन तिथि August 1, 2016.